Nurul Ali. 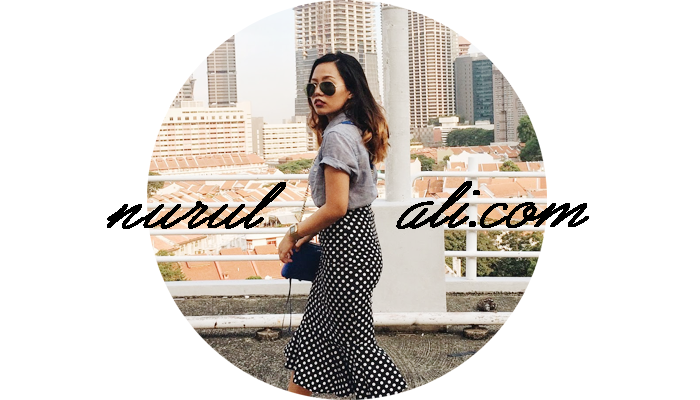 | Singapore Fashion & Lifestyle Blog: Lights. Camera. Action! My followers on Twitter would probably know that I was recently selected for a new reality show. I would say it’s more like a game show, except that it involves fashion. The show will be aired early next year. Not sure if it’s going to be on TV but what I know is that, it will be aired online. Never thought I would get selected. If I remember correctly I went for the audition in late August. Since then, they never contacted me. Then in late October, I got a call from Dawn (I think she’s the Producer’s Assistant. Ok I totally forgot! Hahaha) that I was one of the 9 people selected for the show. Haha. I didn’t really take much pictures cause I was nervously thinking of what to explain to the panel of judges – who will be judging on the items I bought, and how I styled my outfit. Ya la I’m like that one. I get nervous easily! Lol. I guess luck was on my side during the judging time, cause none of the judges criticized my outfit. In fact, they complimented me! I didn’t go to the next round though, but I swear that already made me feel happy and satisfied. That aside, I got to make new friends with the Fashionistas! Gosh they are a bunch of funny people! Waiting time wasn’t such a bore with them around. Did I also mention that the filming crew are nice and thoughtful people too? There was one time Dawn ordered Subway for our lunch without knowing that Subway is not Halal. Ok la I have to admit that I am not that strict when it comes to this, just as long as I do not eat pork. (confirm plus chop all the pious Muslims will condemn me one!) So I told Von, the Production Manager that I could make do with the Tuna Sandwich from Subway but she insisted in ordering MacDonald’s for us - the Muslims. That’s really a sweet gesture for her to do so la! Oh and my sweet competitor, Shing Yi gave her Chicken puff from Old Chang Kee to me while we were waiting for our food. Wah lau why you all so kind to me one?! What did I do to deserve all thisssss? :') Hahahaha. Poor guy had to come early to the set and leave late. Respect how he still continue with the shoot despite of feeling so exhausted. Aaron, my mentor! He looks like Gurmit Singh when he remove his glasses! Haha. That's Amin on the left. When I first met him, I thought he was some black guy from Nigeria. Turns out, he's a malay dude. Haha. Oh and he raps! On the day when I had to leave the set, everyone in the waiting room + production crew wished me a happy anniversary with my boyfriend cause it was our anniversary! It's like every person I bid goodbye wished me. It was so funny! Hahaha. So sweet hor you all. Can't wait to watch myself! I wonder how my voice really sounded like. Hahahaha.